Wash grows increasingly frustrated with hearing stories of the "good old days" when Mal and Zoe served together, and generally with the fact that his wife seems to have a stronger bond with her captain than with him. Wash forces himself to accompany Mal in Zoe's stead on a job which then goes sour, when Mal and Wash are captured by Niska, who still holds a grudge over Mal not delivering on the train job. Niska tortures Mal and Wash. Zoe arrives to negotiate for their release, the crew having pooled their earnings from the job on Ariel to ransom their shipmates. Niska, however, feels the sum offered is enough for only one of them, and she must choose who to save. Without hesitating, Zoe chooses Wash. Niska reconsiders and says it's enough for part of one other, so he also gives her Mal's freshly cut-off ear. - This episode further confirms, along with Jaynestown's reference to ancient Egypt, that detailed records of "Earth that was" survived. - Book: "Did you ever read the works of Shan Yu?" Simon: "Shan Yu the psychotic dictator?" Book: "Yep. Fancied himself quite the warrior poet. Wrote volumes on war, torture, the limits of human endurance..." Simon: "That's nice." Book: "He said, 'live with a man forty years, share his house, his meals, speak on every subject. Then tie him up and hold him over the volcano's edge and on that day you will finally meet the man.'" - Book and Simon analyzing River's condition. - Jayne, after seeing that Inara's client was female: "I'll be in my bunk." - Wash forcing himself onto the mission in the place of Zoe. - Wash, as he and Mal were being captured: "Now I'm learning about scary." - Mal and Wash arguing with each other while Niska tortures them. - Niska making Zoe choose between Mal and Wash to rescue, and Zoe choosing Wash without hesitation. - Niska cutting off a piece of Mal's ear and giving it to Zoe as she leaves with Wash.
- Niska after reviving Mal, displeased that he had died: "When you die I can't hurt you anymore." - Zoe referring to Wash's maneuver to dock Serenity with Niska's station as throwing a dart and hitting a bullseye 6,000 miles away. - The Serenity crew assaulting Niska's station. - Mal rising up and assaulting his torturers. - Kaylee choking up during the battle and running away, then River saving her with some surprising precision sharp shooting. Downright inhuman. - Zoe: "Jayne, this is something the captain has to do for himself." Mal: "No it's not!" - Mal: "So, I hear you all took up arms in that little piece of action back there. How are you faring with that, doctor?" Simon: "I don't know. I never shot anyone before." Book: "I was there, son. I'm fair sure you haven't shot anyone yet." Another fine piece of storytelling hinging on continuity. Many arcs in fact get served here, some better than others. Some nice stuff: Jayne is being awfully generous to the rest of the crew to make up for what he did in the last episode, Book displays creepily deep knowledge of crime as well as some damn fine marksmanship in this episode, and River, well, that was just crazy. And awesome. Finally, Wash's previously very subtly hinted at jealousy surrounding Mal's and Zoe's old war buddy status comes out in full force in this episode, perhaps overly so. Here Wash is jealous of Zoe's experience with Mal during the war to such an extent that he even trivializes her reminiscing about the war. That scene and many more like it make me thoroughly unsympathetic toward Wash's character. They turn him more or less into a petty douchebag and I only started to like him again while he and Mal were being tortured, and only because the scene was just so damn charming. What really redeemed his character for me though was his desire to join with his wife and lead the charge to rescue Mal. I suspect Wash got over his pettiness quickly after this episode, though I wish it had been done in a less immature manner. I felt that this sort of stuff was overdone. The continuity with Niska was also appreciated, though he seemed less nuanced in this episode than in The Train Job because he appeared as little more than a mustache twirler here despite the attempt to add layers to him by having him cite the works of Shan Yu in parallel with Book. All we really see of him here is an extended version of what we saw in The Train Job when he tortured somebody briefly to demonstrate his resolve to Mal. I was hoping for more depth. 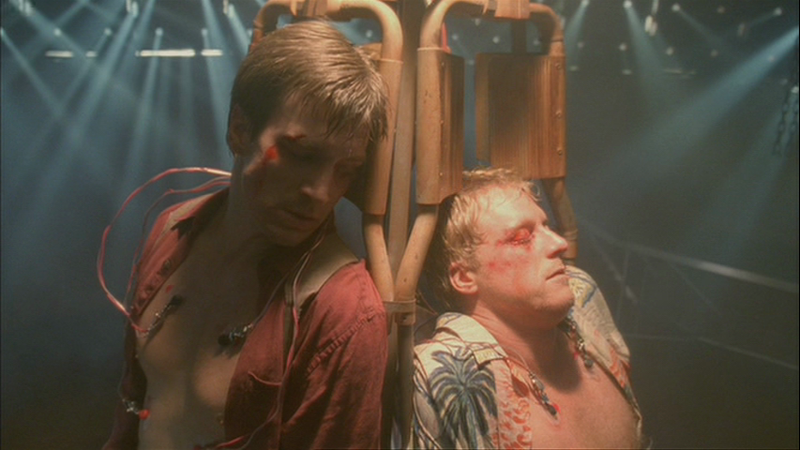 In total, however, once again, Firefly delivers another terrific episode.